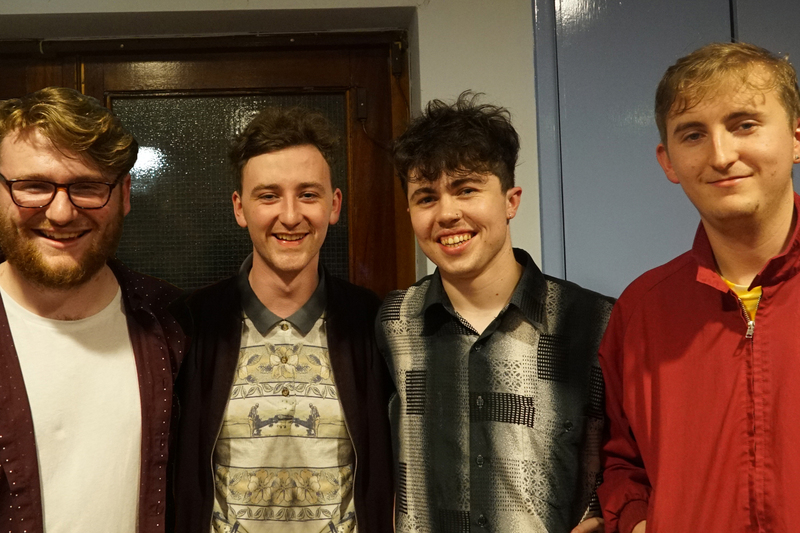 The Comstocks (formerly Fresco Future), an alternative band from Dublin, Ireland, are one of the latest ReverbNation artists to get signed to End Of The Trail Records through one of our opportunities. We spoke to them about how they got started, the pressures of being a DIY artist, how you don’t need a fancy studio to get a great recording, and lots more. Check out the interview below. Well, three of us met in school and started playing music together in the band for our school’s production of ‘Bugsy Malone.’ It was here that we began to realise that playing tunes was actually decent craic and was worth something more than just skipping classes, so we kept on rehearsing together and over the course of a few line-up and name changes we started writing and performing our tunes for the last three or four years. Playing “indie music” as Fresco Future (and picking up our drummer Conall along the way) has lead us to a point where we’re beginning to lean more towards making slightly more reflective and sincere music than our younger selves had intended. One aspect of being a DIY act, which is quite difficult is the pressure of having to shoulder the cost of all musical and recording equipment ourselves. As a group of relatively non-wealthy students it can be tough at times to afford strings and leads for our instruments, let alone the instruments, microphones and interfaces themselves. This, however, is an investment, which is ultimately worth making, as it gives us opportunity to build up our catalogue of equipment and expand our expertise and options when producing and performing our music. The biggest struggle by far, which we have encountered as a group, is the difficulty of trying to create, produce, perform, record, and advertise our music all by ourselves. It can be extremely difficult to stay on top of all these separate tasks while also performing each role to our preferred standard. It was Cormac’s father that came across ReverbNation, and pushed us to make use of it. One aspect of being a DIY artist is that more often than not you rope everyone you know into helping out with promotion, organisation, and everything in between. We set up the account and continued on our way trying to get a good profile together in order to try and succeed in applying for some of the ReverbNation opportunities. Through ReverbNation we got some airtime on Salford City Radio, which never would have happened without this platform. As for End Of The Trail, we hadn’t heard of them before the opportunity came along but went ahead and applied for it anyways. The submission process was relatively straightforward, and went along with several other applications that were sent off that day. To be perfectly honest, we were surprised and a tad apprehensive when we found out that we had been picked for this opportunity. But we all sat down and had a chat about it and decided that it was a great opportunity for us to open some new doors and reach some new people. As well as that, with all that was going on with a name change and style change this is the best start we could get as The Comstocks. I suppose we’re hoping to expand ourselves to a wider audience, as well as expand ourselves as musicians and creators. It can be easy to remain in your comfort zone, geographically and creatively, so this is an opportunity for us to keep growing and prevent ourselves from being complacent. It can be really tough sometimes, but it’s all about perseverance and learning from mistakes. There’s going to be gigs to empty rooms and there’s going to be venues and bookers trying to do you out of money. The trick is putting the time and effort in and not wasting those experiences by refusing to learn from them. Every live show makes you tighter as a band, and you learn how to spot shady organisers fairly quickly. If you’re staying engaged and giving it 100% despite the challenges, people will notice. As well as this, we’re firm believers that you don’t need £10,000 studio in order to record your own music. London Pleasures was recorded and mixed ourselves, and although it took a while and there was a lot of learning involved, it’s been liberating in the fact that we have the tools to record our own music to a high quality. Everything can sound just as we want, and we’re not being held back by hourly rates from engineers and studios. That said, we’re not anti-studio. Having an outsiders opinion on your songs can be invaluable, and make the process an awful lot quicker than going down the DIY route. What’s up next for The Comstocks? We will be debuting a lot of new material on the 16th of June supporting our local hometown heroes, Super Extra Bonus Party, at Judge Roy Beans in Newbridge. We’re extremely excited for this gig, as well as for the opportunity to release our music with End of the Trail. We’re also planning a couple more single releases in the next few months, culminating in an EP that we’ve just written. I guess we’ll figure out what’s after that when we get to it! How lovely ! That is . thanks for sharing .